The Town Hall was constructed between 1904 and 1908 to the designs of Sir Alfred Brumwell Thomas in the free English baroque style, and is a grade 2* listed building. Incorporated within is a very fine ballroom with barrel-vaulted ceiling a rich plaster decoration containing a Wurlitzer Publix One Cinema Organ (Opus 2120) owned by the Lancastrian Theatre Organ Trust. The four manual twenty-pipe rank and piano instrument started life 88 years ago in the Paramount Cinema on Oxford Road in Manchester, a 3,000 seat luxurious venue to the designs of renowned architects Verity and Beverley. 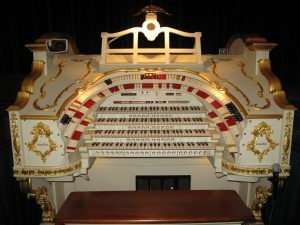 The cinema opened in December 1930, and the organ was shipped from the Rudolph Wurlitzer factory in July of the same year. It was originally going to be one of a series of 50 proposed Paramount Theatres which were to be equipped with the ‘Publix One’ style of Wurlitzer organ, designed by famous American organist Jesse Crawford. The Manchester Publix One was the only such model to leave the United States. The Odeon Cinema as it had then become in 1967, was due for closure under the Rank Organisations modernization scheme to create multi-screened cinemas. It was at this time that the LTOT was formed to save both the Odeon instrument, and sometime later another fine Wurlitzer from the Gaumont cinema also on Oxford Road. In 1977, prior to the organ being installed in Stockport Town Hall, the Paramount/Odeon organ was at home within the fine acoustics of Manchester’s Free Trade Hall, constructed between 1853 and 1856 later remodelled with a superb interior in the ‘Festival of Britain’ style. In August 1996, Manchester opened a new International Concert Hall, called the ‘Bridgewater Hall’, named after the Duke of Bridgewater who built the Canal system around Manchester. As a result the Free Trade Hall was closed and as the new Concert Hall was built with a Marcussen Concert Organ. The Freetrade Town Hall was closed in 1997 for reconstruction into a hotel and the fine instrument was moved for a second time by the technical team of the LTOT to Stockport Town Hall, where it enjoys equally fine acoustics in the reverberant ballroom. The two organ chambers are located at the rear of the room, with the 15hp Discus blower being several floors lower at basement level. The console is positioned on a custom lift with a sliding floor panel to cover the aperture when parked at basement level. Wurlitzer Publix Number One, is used regularly within the ballroom for concerts and ballroom dancing promoted by both the LTOT and Stockport Council.